Under Armour® Beyond stainless steel water bottle with 18 ounce capacity isn't your ordinary water bottle. 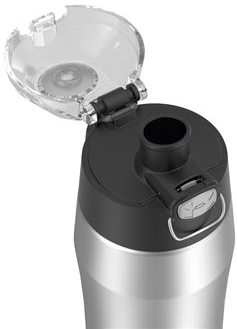 Built with an active lifestyle in mind, it uses vacuum insulation to keep drinks cold for up to 14 hours. On top of that, it's got a lockable lid and durable design to help eliminate leaks and spills. Prem version of bottle has Under Armour® logo at bottom of bottle.